Actually it crashes, falls, rolls, slides, slumps, flows, slips, and creeps downhill. Rockfalls happen off of cliffs and road cuts. Natural rock cliffs are usually quite stable except in areas of rapid erosion, but man-made cliffs are very unstable. There was a very recent (October, 1996) rockfall in Yosemite National Park. Landslides can be large and dangerous. They commonly start out as a coherent mass but may break up into a flow if a long distance is covered. 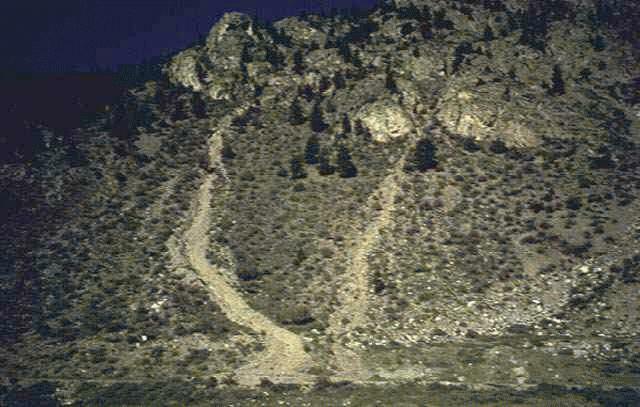 Some local examples include the Slumgullion Slide near Lake City, CO. Another is the Gros Ventre near Jackson, WY. Another damaging slide was the Vaiont Dam Disaster in the Italian Alps on October 9, 1963. The 875 ft high dam was completed in 1960 and the reservoir took several years to fill. A large block (240 million m3 was lubricated by the rising water and slid catastrophically into the reservoir behind the dam. The dam held, but a 100m high wall of water sloshed over the dam and killed about 3000 people downstream. Here a water-fluidized debris flows have carved charcteristic incised courses with levees above I-70 near Georgetown, CO. These flows happened during a severe thunderstorm in July, 1989 and deposited a debris fan that closed the highway for a few hours. A debris flow is a water-fluidized flow of rock and soil that moves down slope. These can be small narrow flows that descend steep slopes after a heavy rain (below Georgetown, CO). Very damaging mudflows may accompany volcanic eruptions or earthquakes. Slumps are marked by movement of a coherent mass a short distance along a curved surface. Slumps are less dangerous because they generally move slowly, but they can still do damage to human construction. A fine local example is the slump at the intersection of highway 93 and U.S. 6 in Golden. They are now building houses on top of the slump. Creep is the unnoticed slow movement of unconsolidated soils downslope. 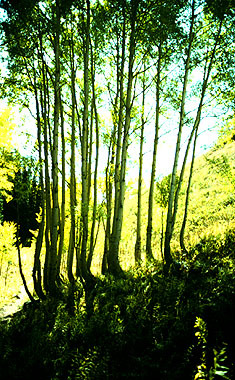 It is commonly seen as curved tree trunks as in the above phote. Important to look for when buying real estate but not life-threatening. 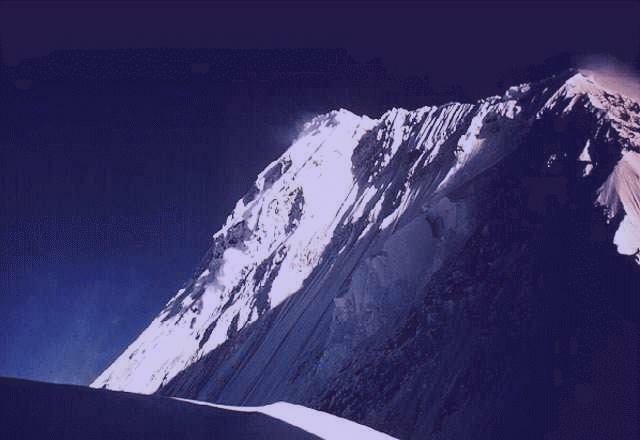 An avalanche is an air-fluidized flow of debris or snow or ice downslope. Avalances can be very fast and dangerous. Here a powder avalanche is descending the upper slopes of Mt. Deborah, AK. Snow Avalanches are the mass wasting of the snowpack and are a particular hazard here in Colorado. Most occur within the first 24 hours after a major snowfall. Any slope steeper than 30 degrees can slide. Powder sloughs are most common. Slab avalanches are very dangerous and occur when the entire snowpack slides. They are most common when a thin snow pack has metamorphosed (recrystallized) over a fairly long time and then receives a heavy fall. Colorado Mountain Club has a current page on avalanche safety, including current avalanche hotline phone numbers for current conditions. Colorado Avalanche Informaltion Center maintains a site with current backcountry avalanche conditions and weather. Cyberspace Avalanche Center maintains a site with general avalnche information and safety products. Complete Skier has more information and simulated internet avalanche. Silverton Avalanche School offers avalanche safety courses. If you get the chance to ski Europe: European Avalanche Services offers rcurrent information on avalnche condition in the Alps and training in several different languages.